January was a brilliant month for Bristol DAWG with seven dogs finding their forever homes and we still have adoptions in the pipeline for February. 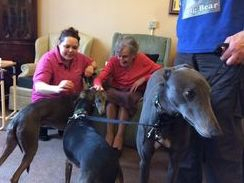 We are getting busier and busier and travelling further afield to home our hounds which is greyt. Keeping spreading the word. We would like to say a massive "thank you" to Amy Wilson and her team at Support Adoption For Pets for the following cheques which we have received from the Santa Paws Appeal in December 2016. Thank you also to everyone who very kindly helped collect in store during this period. Thank you to all the staff at all three stores for making us so welcome. We would like to thank Jane Crow for her very generous donation on Justgiving to help with Sassy and Milly. Thank you Jane you are extremely kind. We promise these two little girls won't want for anything now they are in our care. Sassy is going back to the vet tomorrow so we should have an update, and Milly going back to the vets in two weeks. Both dogs need to improve substantially before they can be vaccinated. Nicky Bromhall and her amazing team at Animal Health Centre, Bristol, (vets used by Bristol DAWG for foster dogs and trustees own dogs), are undertaking a fundraising event to raise funds for the charity. Nicky and her team will be undertaking the 5k and 10k night run in Leigh Woods on Saturday, 25th February starting at 5.30pm. If you are around please pop along, all the trustees will be there with our collecting buckets and dogs to cheer them over the finishing line. If you would like to sponsor everyone at Animal Health Centre this can be done by logging onto our Justgiving page on our website. Just a couple of pounds will make a difference to the dogs in our care. Please mark donation so we know it is for the Night Run. Thank you Nicky and the team for the brilliant veterinary care you provide to Bristol DAWG. Sassy has been back to the vets today to see if she is well enough to be vaccinated, check her ears and examine her skin. What a brilliant job Ann and Barry have done with this little girl. Sassy has put on 2kg this week, three small meals a day seems to be doing the job!! Her ear infection has completely cleared, she has had her first vaccination, her skin is so much better and 95% of the sores on her body have now stopped weeping. She just has some antibiotic cream for the few areas which still look a little red and angry. What a long way this sweet little girl has come in a short space of time. She doesn't need to return to the vets for a month now as they are so pleased that she is moving in the right direction. Thank you to everyone who has asked about this lovely little girl. 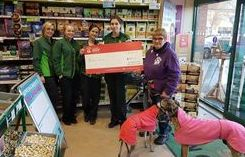 Massive thanks to Anne Maddox, Community Champion at Asda Filton, for supporting the work we do. We have today received a cheque for £200 from the green token scheme. Thank you Anne you have always been very kind to Bristol DAWG. 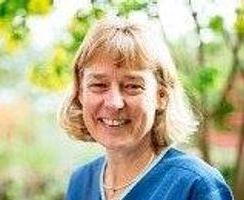 Congratulations to Nicky Bromhall, who has been nominated for Vet of the Year in the Petplan Veterinary Awards and to her practice, the Animal Health Centre, a nominee in the Veterinary Practice of the Year category. Thank you to Zelah Ellis who invited the Worth Gang along to visit Beaufort Hall today. I think the residents enjoyed the dogs. Malcolm was especially generous with his kisses. We have been advised today that Ice and Nano will be leaving Spain to travel to the UK on the 17th May - another two lucky galgos. The hunting season has now finished in Spain and there will be hundreds of unwanted galgos who will suffer greatly, so although we are only able to help two dogs at the moment, Nano and Ice have a lot to look forward to. Quick update on Milly, the sweet little girl who arrived with Bristol DAWG just over a fortnight ago in very bad condition and extremely thin. Her owner said that he couldn't keep any weight on her and that she suffered from separation anxiety!!! Denise Smart to the rescue, super foster mum, Milly went back to the vets today for a check up and she has put on 4kg - she now weighs 23kg, all her pressure sores have nearly disappeared, and she was well enough to have her first vaccination today. She also has to have a dental, which is planned shortly. As for separation anxiety - Denise says she is the perfect house guest. Massive thanks Denise you do an amazing job with your fosters. Bella (formerly Marie) has settled in amazingly well with the Sainsbury family, they reckon she's been reading "How to be the Perfect Dog"! She loves her walks, her garden, her food, her bed, everything! 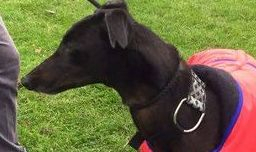 More good news, Tommy has found his forever sofa in Cheltenham with Tamandra. Tommy is now called Sponge and looks extremely happy to have been chosen. Lovely, lovely boy - another lucky dog to have been saved by Eila Moloney. Thank you to Sarah Kendall, who very kindly drove to Cheltenham to do the home check. Gerry spent a lovely hour this morning with Gaye in Pucklechurch. Gaye has adopted the lovely Robin who is now living with four other dogs, two border terriers, a springer spaniel and a bull lurcher and is having a really good time!! Gaye has a massive paddock attached to her property so loads of space to run and play - what a lucky boy. Thank you Gaye for giving Robin a wonderful new home. Massive thanks to Nick and Sharon Foulger for fostering Robin whilst he was waiting for his forever home - another brilliant job. What a long way this little lad has come since being thrown from a car on the ring road!! More dogs coming from our very good friend Eila arriving Saturday morning. As always very grateful to Kristie and James Davies for getting up in the early hours to settle the dogs in. The trustees would like to say a massive, massive 'thank you' to Megan and Kim for all their hard work in organising yet another successful charity auction. Lots of hard work goes on behind the scenes to organise such an event - well done girls, as always we are soooooooo grateful, as are the dogs we care for, but they can't tell you!! Thanks also to all our wonderful supporters who bid so generously to help us with the work we do. This month our vet bills will be higher than normal, so thank you for every penny you bid. We will have a final figure later today but we are hoping that it should be over £1,000, which is amazing. Every month we have to find between £3,200 - £3,500 to keep the charity running, and some months it definitely isn't easy, especially if we have extra big vet bills, so as you can imagine this money is very gratefully received. Bristol DAWG will be represented at a table top sale at St Peter's Church, Frampton Cotterell on Saturday 4 March between 14.00 and 16.00 hrs. 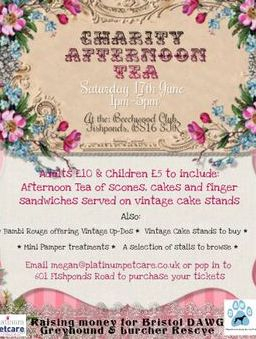 Thank you to Jan Lazenby for arranging this and manning the stall. Lovely news to end the week, our sweet little Sorcha has found her forever sofa in Tewkesbury, Gloucester with Martin and Mandi. 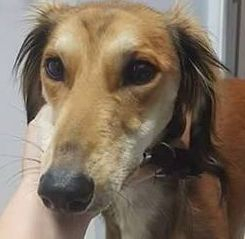 Sorcha (now renamed Mouse) has gone to live with the very handsome Juke (Saluki x) who Martin and Mandi adopted from Bristol DAWG a little while ago. The dogs are getting on well and Mouse has settled quickly, thank you for giving her a lovely home. We must also say a massive "thank you" to Suzy and Charlie Roberts (not forgetting Teddy) for fostering Mouse while she was waiting to be adopted. You did an amazing job, thank you so much. 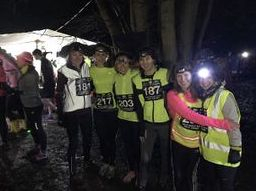 Bristol DAWG trustees and other halves attended the Wild Night Run at Leigh Woods in support of Nicki and the girls of the Animal Health Centre, who ran for DAWG. Thank you ladies so very much. It was a chilly wet muddy night and we took eleven dogs along as additional support!